To my delight and surprise this morning, I found a press release from Ohana Software regarding their application PAF Insight (which integrates with PAF - Personal Ancestral File) and the New Family Search. First I would like to give you a little background for those that are not familiar with PAF. Personal Ancestral File (PAF) is a genealogical program that has been used by millions of people and has worked well for quite some time. PAF is available for a free download at FamilySearch. A few drawbacks to the program have been that it is only Windows based and that it has not been able to search the internet from within the program itself like many other genealogical programs. As a result of these drawbacks a few programs have been developed to help fill in the gaps so to speak. PAF Pal has meet is a small add-on program to PAF that has enable the user to search the internet from within the program. The greatest addition to the world of PAF was the development of PAF Insight which allows the user the search IGI files located in the Family History Center in Salt Lake City. The search engine for PAF Insight is amazing and works better (in my humble opinion) than the search engine located on FamilySearch. Now for the press release from Ohana. I thought about summarizing the post to me, but felt it was best said by Ohana Software themselves. I have included it in it's entirety for you to read. The opening line from "New York, New York" jubilantly exclaims, "Start spreading the news". That fits our mood at Ohana Software as we may finally put into writing upcoming changes to PAF Insight. First, we are changing our name from PAF Insight to FamilyInsight. The name change to emphasizes family as the foundation of the work we do. After all, Ohana is Hawaiian for family. It also emphasizes our continued ability to connect to FamilySearch. FamilyInsight takes the program into the next generation by providing you with two-way synchronization with the new FamilySearch. Second, FamilyInsight will have the capacity to read and write to GEDCOM files without importing them into PAF first. You can see the quality of the file by opening the GEDCOM into the Edit RINs and Pedigrees mode. You can also open your file and the GEDCOM file in the Compare and Sync mode and update your records directly from the GEDCOM. Last of all, the Edit Places mode in FamilyInsight will have increased functionality. When you open your file into this mode, the program will scan every place and check it against the place authority database in the new FamilySearch. Using the suggestions for unrecognized places, you can correct, complete and standardize the place entries in your file. You may also mark places as valid if you know they are correct. As you can imagine, we are excited about the forthcoming improvements to FamilyInsight and its ability to synchronize with the new FamilySearch. I imagine you have some questions so let's see if I can guess what they are. Why will I want to use FamilyInsight with the new FamilySearch? I think there are three reasons for using FamilyInsight. First, since you are accustomed to comparing IGI records with the records in your file, you will probably find it easier to continue using this format than the format used by the new FamilySearch. Second, you can select information found in the new FamilySearch and add it directly to your PAF file as easily as you currently update records from the IGI. The third reason needs some background. The new FamilySearch combines all temple ordinances for deceased individuals, LDS membership records, and records from both the Ancestral File and the Pedigree Resource File into one massive database. If you or your ancestor's information exists in any of these databases, it now exists in the new FamilySearch. Now, think of each of these entries as papers within a folder that represents your ancestor. With this analogy in mind, you should now understand the huge change or "paradigm shift" for sharing information. Uploading a GEDCOM of your complete set of records to the new FamilySearch will be redundant. Therefore, the third reason we will use FamilyInsight with the new FamilySearch is for the two-way synchronization of records. Not only will you get information from the new FamilySearch into your PAF file, as you do now, but you will also add information from your file to someone's "folder" in the new FamilySearch! Will my information by over written by what someone else adds? N0! Remember how I describe each person's "folder" with "papers" from the various sources? When anyone finds a family member in this system, they can connect the person to their personal family tree. Then, using FamilyInsight, you can add missing pieces of information to their already existing file. You may also "dispute" existing facts by providing alternate information along with sources. Instead of adding a completely new entry (or "piece of paper"), you simply add supplementary information without duplicating or overwriting existing records. What should I do when I first log onto the new FamilySearch? You should begin finding matches to your records and tying them to your family tree. As you build your tree in the new FamilySearch you can also update your records and synchronize your information with existing records. As you progress, FamilyInsight will detect changes to your family records on new FamilySearch. You can review changes and accept or dispute them as you see fit. When can we expect to see FamilyInsight? FamilySearch invited the early web service affiliates to participate in a very limited beta test of their software with a copy of the new FamilySearch. This test is set to begin about October 22nd and the testers have been selected and notified. After this test period of about three weeks, we hope to have a live Beta version available for download from our website. At that point, anyone wanting to participate in the beta may do so but only those living in a temple district using the new familysearch will have the full functionality of the program. BUT ONLY THOSE LIVING IN A TEMPLE DISTRICT USING THE NEW FAMILYSEARCH WILL HAVE THE FULL FUNCTIONALITY OF THE PROGRAM. Those of us living in other temple districts will be able to test using a GEDCOM and all the other great features we haven't even mentioned. We hope many of you will test these functions for us. I am not a member of the Church of Jesus Christ of Latter-day Saints. When can I use the new FamilySearch? The new FamilySearch must be deployed to members in all temple districts before it will be opened for general use. Staggering the initial use of the website allows for better support and education. All of us who are waiting for the new FamilySearch should continue our file cleanup efforts. We should also strive to understand the new model of collaboration made possible by this new program. Will I be able to reserve names for doing temple work through FamilyInsight? FamilySearch has not implemented the procedures for 3rd party products, such as FamilyInsight, to reserve names for temple work. When FamilySearch approves the procedures, FamilyInsight will then provide this function. Will I have to purchase this new program to get FamilyInsight? No. Updating to FamilyInsight will be like all other updates. 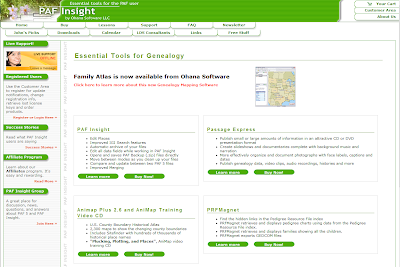 If you have a current license for PAF Insight, you will be able to download the update to FamilyInsight. If your license has expired, you may renew at any time and download FamilyInsight. I hope you enjoyed this glimpse into the future. Keep reading Ohana Insights and visiting our website for more information on the beta test and eventual release of FamilyInsight. PAF Insight has many other useful tools including editing places, RINS, and also find those disconnected lines within your family database. If you would like to learn more click PAFInsight/FamilyInsight to be directed to Ohana Software.